i completed this painting in the late months of 1996 through early 1997. a friend and i had moved to the sun valley and were working different schedules, him days and i was working nights. i would return, turn on the radio and work on this until the sun came up. it took me about 100 hours. 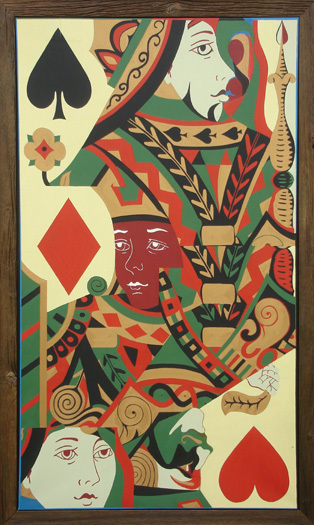 the image is a jumble of playing cards that were laying around the apartment, but on a grand scale (six feet tall). the frame was built by woodworker duane patricio of portland in early 2006.